Being a huge fan of the holidays my husband was shocked when I mentioned not putting up a tree this year. In previous years (pre-baby) we have always put up two, now I barely have the room or patience for one. Images danced in my head of Afton terrorizing the tree and all the antique and sentimental ornaments that adorn it. I just didn’t want to think about her breaking her great-grandmother’s delicate santa clauses or poking an eye out with a branch. But after many discussions I gave in and we put up our tree (we are now on day 4 without incident). I like to think this is because of the felt tree I made just for her. I put it up a few days before Thanksgiving so she could get used to it before we put the actual tree up. She enjoys taking the decorations off on a whim or changing them around or just throwing them all on the ground. I just kept telling her that this was her very own tree, and made a big deal about it. The best part about it was it was so easy to make. I just bought a yard of green felt from the fabric store and picked up a few felt squares in various colors for the decorations. 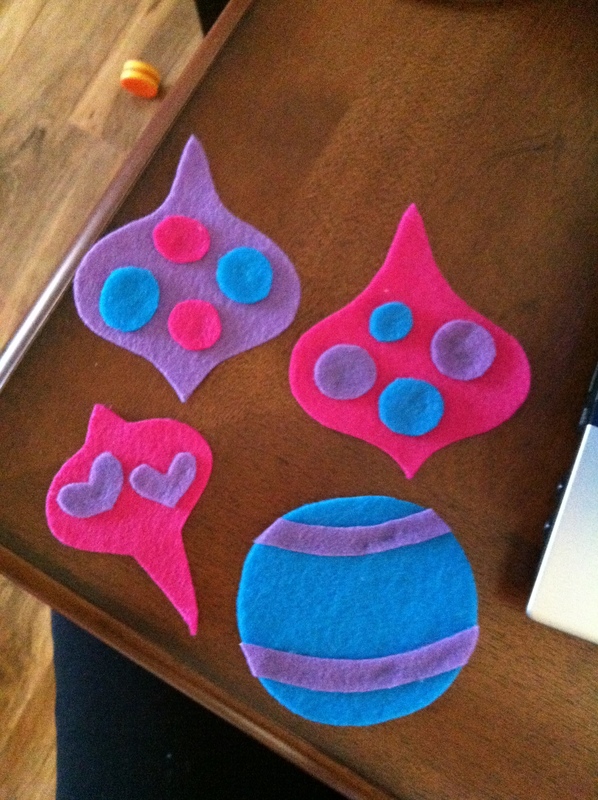 This project had to be no-sew for me, well because I don’t sew! 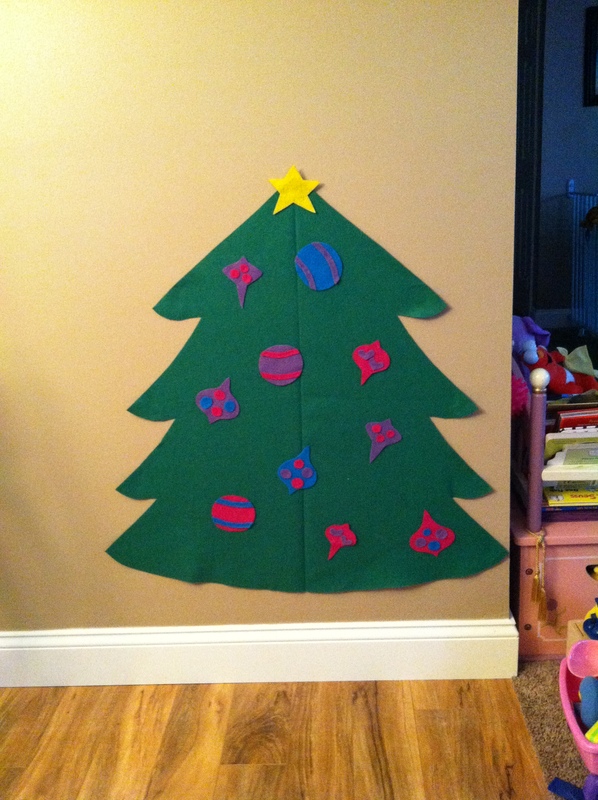 I folded the green felt in half…sketched helf a tree on it with a sharpie…cut it out and…you have a tree! 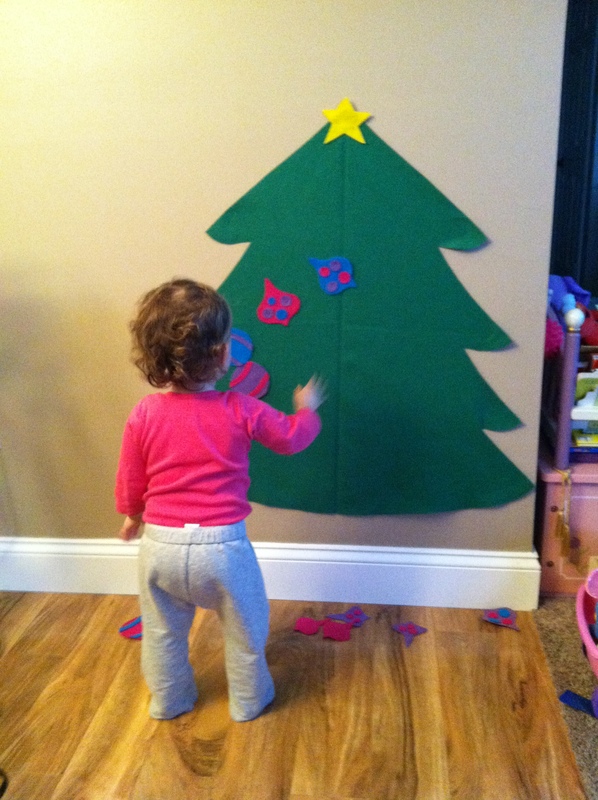 Posted in Afton's Mom, DIY and tagged christmas tree, DIY, felt ornaments, felt tree, holiday DIY, tutorial. Bookmark the permalink. So you spent some money on Etsy buying photo props for your holiday photos and you don’t want to just throw them out or put them in a box for next year’s photos? Why not fit them in to your holiday decor! I didn’t buy any special holiday photo props this year, I made them, and since I put a lot of blood, sweat and tears into them you better believe I was going to find some way to display them for the holidays. The first item I wanted to recycle was the holiday banner I created. It was super easy and cheap to put this banner together. The only thing I needed to actually buy was a scrapbook tablet to use as the pennant backgrounds. I had the rest of the items already on hand (twine, mini clothespins, printer paper, scissors, glue stick). 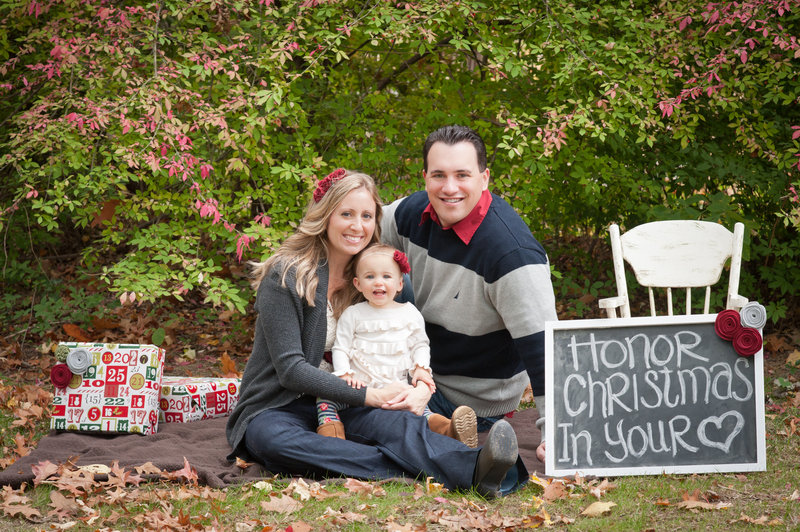 To see how this banner was used in our holiday photos, check out my “Tis the Season post. I also plan on recycling my chalkboard yet again to hang somewhere in the house…maybe by the fireplace downstairs with a cozy Christmas saying…any suggestions? And I made a felt mistletoe for our holiday photos that I did not get to use in them…so I will be hanging that in our doorway. Have fun seeing what you can recycle for the holidays! 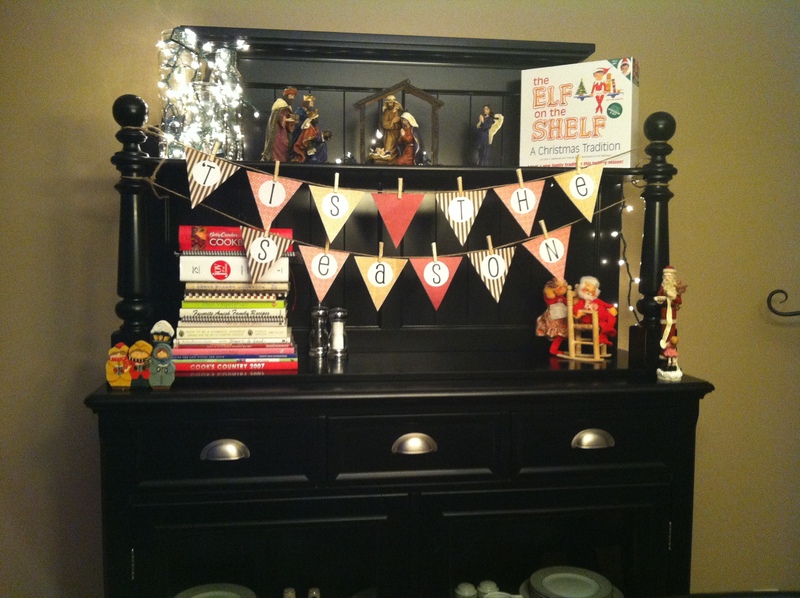 Posted in Afton's Mom, DIY and tagged christmas, christmas banner, decorations, DIY, holiday banner, tis the season. Bookmark the permalink. My husband’s entire outfit was found in his closet, Afton’s dress was in her closet and actually from last season but the rest (tights, boots, headband) were all new, I already had my sweater and shoes but bought new jeans and the lace tank. Now for the props. The antique rocking chair is ours and was actually handed down to Afton on her first birthday from my Godmother. The blanket and chalkboard we had, I made the felt flowers and the “presents” are just empty shoe boxes that I took my boots out of. So there you have it…holiday photos on a budget. Again, another holiday photo. The only things added in this one are the bear (which was a gift when Afton was born) and the “Tis the Season” banner, which I made. 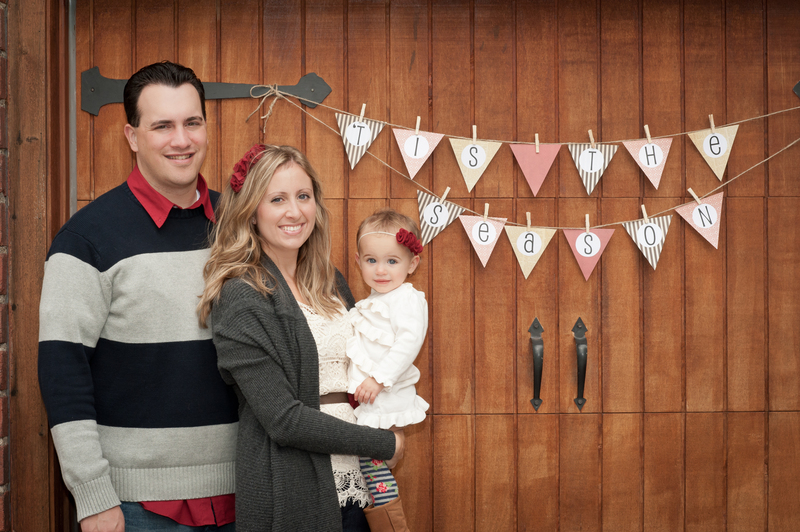 I already had the twine and mini clothespins from the banner I made for Afton’s first birthday party so I just spend $9.99 and bought a scrapbook paper tablet for the background paper and I printed the letters from my computer and just cut out circles around them. Oh and one more thing, I made the accessories Afton and I are wearing. The red ruffle headbands and the felt flower belts (you really can’t see mine in the photos I posted and Afton’s is tied to her shoe). Thanks to BFF it went from being a belt to shoe decor. See I can’t do it ALL by myself! So I hope I inspired someone to look within before going out and spending a lot of money on clothes and props for holiday photos, because even though you want that holiday card to look good, you still have gifts to buy! 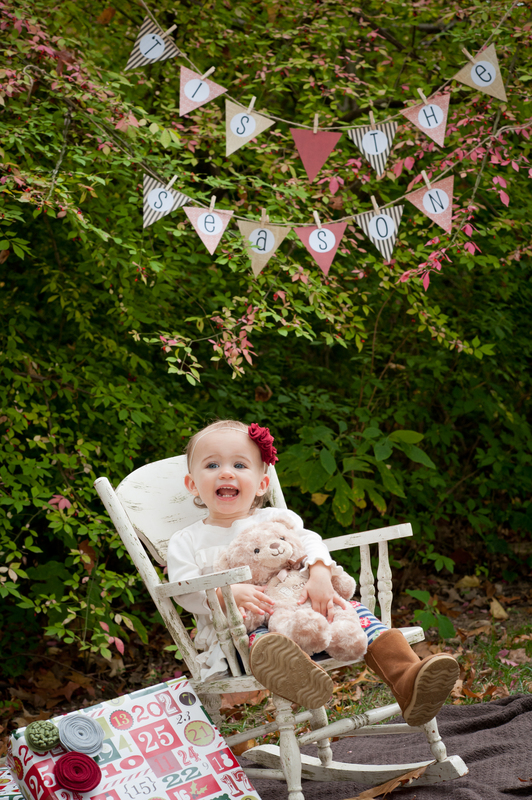 Posted in Afton's Mom, Photos and tagged christmas photos, family, holiday photos, photo banner, photo props, photos on a budget, what to wear. Bookmark the permalink. 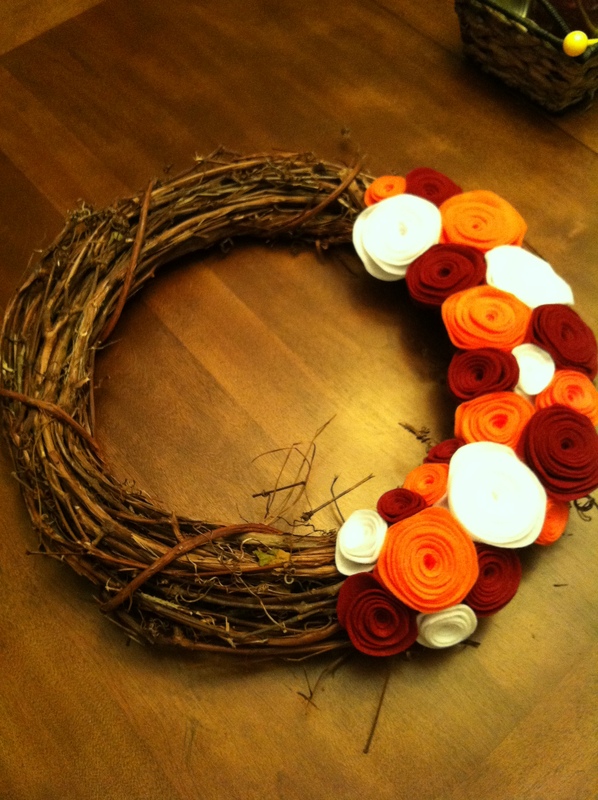 I just got done making a Fall felt flower wreath for my brother’s girlfriend and I really liked how it turned out, so I thought I would share it. I have to admit that when she brought over the materials I wasn’t in love with the colors she picked (bright orange, white and deep red). I actually thought they were ugly, but hey, I wasn’t going to have to look at it everyday, right? 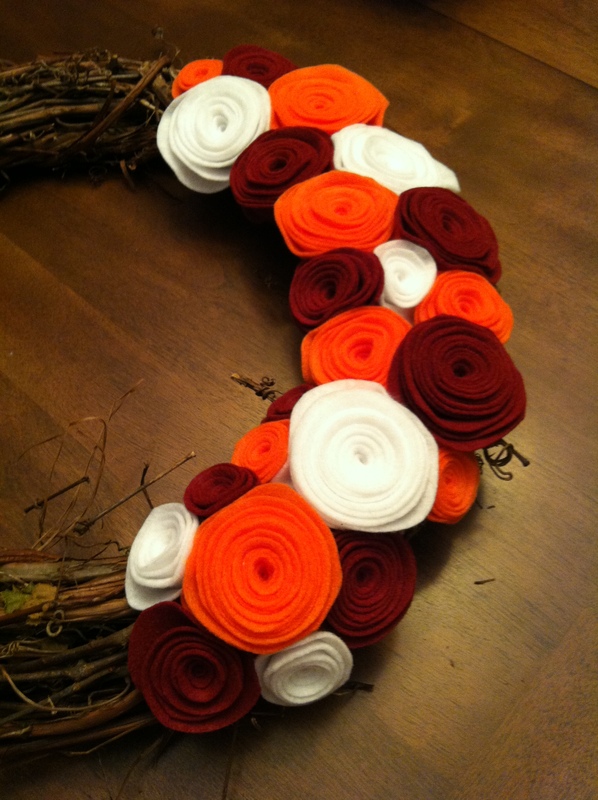 Posted in Afton's Mom, DIY and tagged christmas, DIY, DIY holiday crafts, DIY holiday decor, DIY seasonal crafts, DIY wreaths, fall, felt flower wreath, thanksgiving. Bookmark the permalink.